4, Jalan Conlay, Kuala Lumpur. DINERS can now enjoy Cantonese cuisine to their hearts content as Tai Zi Heen Chinese Restaurant at Prince Hotel & Residence Kuala Lumpur has introduced a new All You Can Eat Dinner promotion. The promotion, which features a menu with over 80% new dishes allows one to indulge in unlimited servings of traditional and contemporary dishes at RM68++ per person. 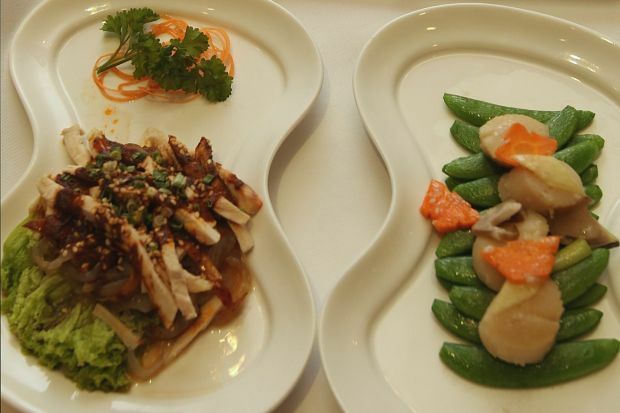 Chinese head chef, Micheal Wong said he gained inspiration from local flavours, the West and Asian countries. I believe in experimenting with recipes to create unique and fresh flavours while maintaining the essence of Cantonese cuisine. I want to keep my diners excited about their dining experience, said Wong. Wong, who has 28 years experience in various fine dining restaurants, is highly regarded by regular diners for his cooking method and spin of creativity. He said the radical change in the restaurants menu was to pique the interest for repeat customers. The new menu was the cultivation of ideas and experimentation for many months, with many ingredients including Ipoh white coffee to bring out the flavour in the various dishes, he said. My personal favourites include Chicken Consommé with Sun-dried Scallop and Cordyceps, Wok-fried Fresh Sea Scallops with Seasonal Vegetables, Szechuan-style Wok-fried Sliced Australian Beef Sirloin, Spinach Bean Curd with Sautéed Asparagus and Nameko Mushrooms and Stir-fried Shanghai Noodles with Shredded Chicken in Supreme Soy Sauce. This promotion will allow diners the opportunity to try out as many dishes as they can savour at a single price, added Wong. The All You Can Eat dinner promotion at Tai Zi Heen is available until Dec 15, from 6.30pm to 10.30pm daily. This is the writers personal observation and not an endorsement by StarMetro.